Spain is considered an exotic country in Europe due to its friendly inhabitants, relaxed lifestyle, its cuisine, vibrant nightlife, and world-famous folklore and festivities. Among many places worth visiting are Spain's thriving capital Madrid, the vibrant coastal city of Barcelona, the famous "Running of the Bulls" at Pamplona, major Andalucian cities with Moorish architecture, like Seville, Granada and Córdoba, the Way of St. James and the idyllic Balearic and Canary Islands. 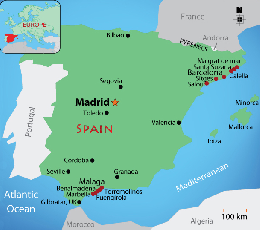 Spain is a diverse country sharing the Iberian Peninsula with Portugal at the western end of the Mediterranean Sea. It is the country with the second-largest number of UNESCO World Heritage Sites. Spain has a very extensive network of libraries and museums throughout the Spanish territory. Sun, water and fun are guaranteed along the Spanish coast, the perfect place to enjoy water sports. Evenings promise incredible late dinners and a passionate night life. Fashionistas will be in absolute heaven as they shop top international brands and designers.